Product prices and availability are accurate as of 2019-03-13 23:04:33 EDT and are subject to change. Any price and availability information displayed on http://www.amazon.com/ at the time of purchase will apply to the purchase of this product. 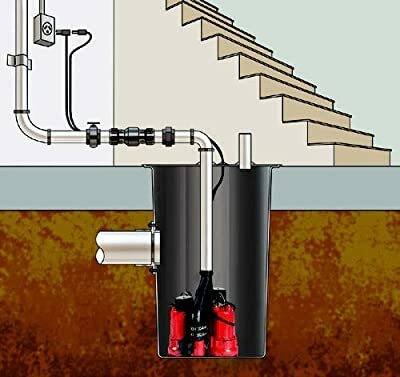 This Red Lion Sump Pump is ideal for average-to-high volume water removal in residential spaces such as basements, laundry facilities, and crawl spaces. This system offers worry-free operation; providing you with a back-up pump, and double the flow rate when needed. Dual automatic submersible sump pumps with pre-assembled piping and check valves included. Maximum head of 25 feet. Comes with PSC motors, 10-foot power cord and 1-1/2-inch FNPT discharges, piggyback float switch and has a clog-resistant design (1/2" solids handling). Single pump gallons per hour at height: 0' - 3,350, 5' - 3,000, 10' - 2,460, 15' - 1,860 and 20' - 960. Dual pump gallons per hour at height: 0' - 6,000, 5' - 5,400, 10' - 4,425, 15' - 3,345 and 20' - 1,725. If, after 30 days, you are having a problem with your Little Giant, Franklin, or Red Lion product, call the Franklin Electric Tech Support Team at 888-956-0000 for Troubleshooting and Warranty Instructions. The Tech Support Team is available M-F from 7:00am-4:30pm CST.